Successfully Added Universal USB Power and Data Link Cable (PSP, iPod, DS Lite) to your Shopping Cart. Universal USB power and data link cable for recharging and transferring data from your favorite portable media and game players. 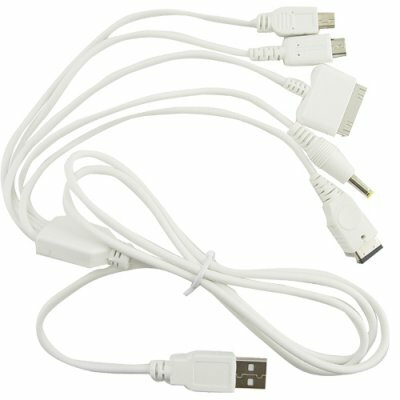 This premium quality USB cable has connections for recharging your Apple iPod, Sony PSP, Nintendo DS, DS Lite, GBA SP. In addition, you can use it as a data link cable for your iPod and PSP units. All in one convenience with the added bonus of coming in an extended 4' length, this is the cable the modern portable gamer has been needing! Provided in quality retail packaging, we are offering this great new item at a quantity of at least 5 pieces in order to give you the absolute best re-sale profit margin from our low wholesale price and even better shipping rates. Brought to you from the leader in wholesale direct from China electronics, Chinavasion. Works with all of today popular portable entertainment systems, including the PSP, iPod, DS lite, etc.